Men of Jalopnik, get ready to dust off your old pair of pleated pants. And ladies, schedule a trip to your local hat shop, where you must find some headgear that borrows its size – and overall shape – from an adult zebra. Because the Pebble Beach Concours d’Elegance is just around the corner. I visited Pebble Beach and the Monterey Car Week for the first time last year, which – by cable news standards – makes me an expert. These are the same standards by which I’m considered a “journalist,” even though my career primarily involves writing posts on Jalopnik that Matt Hardigree shares only after I strenuously threaten his family. Anyway, as an expert and a journalist, I feel it’s my duty to provide you with a little advice. And that it advice is: go to Pebble Beach. And visit the parking lots. Before I explain further, some background. The Pebble Beach Concours d’Elegance is a rather upscale car-related event held in the luxurious seaside town of Pebble Beach, California, where the forecast has been “clouds and light mist” ever since Pangaea split apart and the continents were formed. Seriously: even the dinosaurs refused to hang out here without an umbrella, or at least a zebra-shaped rain hat. When I visited Pebble Beach (or “Pebble” as it’s called by the kind of people who can tell apart Hispano-Suizas), I arrived late, left early, missed most of the big events, and generally had the time of my life. Part of the reason I enjoyed myself so much was my method of arrival. Bored with the rental car choices at LAX, my friend Dan – who lives in a tiny apartment in California with ocean views, provided that you walk out on his balcony and stand on a chair – purchased an E39 BMW 5-Series wagon for us to drive from Los Angeles to Pebble Beach. The theory was he’d sell it after the event for exactly what he paid, thereby beating the rental car companies at their own game. So I flew to L.A., and we roadtripped up the Pacific Coast Highway in a BMW. OK, so it was just an automatic 528i. And yeah, sure, the CD player didn’t work, the LCD information display only had about six pixels left, and the odometer was showing 230,000 miles. And for some reason, the previous owner had painted the interior blue. But at least it wasn’t a Corolla from Hertz. It wasn’t just getting to Pebble that made it so fun. The events played a part, too. Take, for example, “The Quail,” which is a car show that features, among other things, tickets starting at roughly the same price as our 5-Series. I skipped The Quail for this reason, though I later discovered nearly everyone who attends actually gets in for free because they’re friends with some vendor, like maybe the guy who delivered the ice. 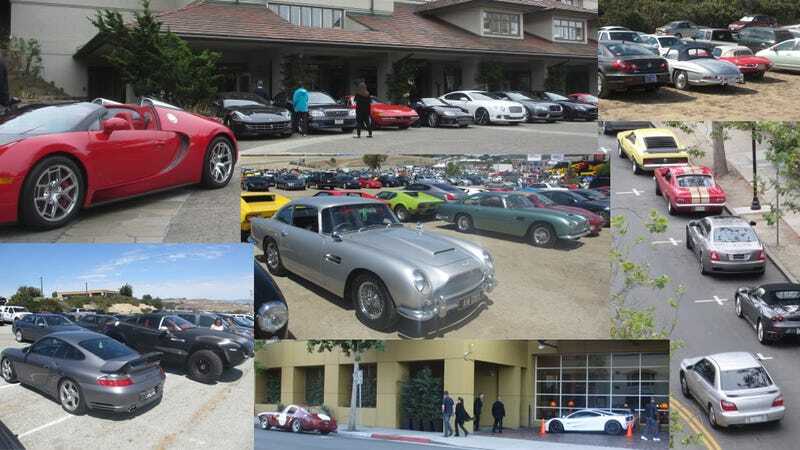 The week’s best event is the “Monterey Historics,” which takes place the Saturday before the Concours. Basically, what happens here is a bunch of gentlemen racers in vintage race cars get together at Laguna Seca Raceway and do everything they possibly can to avoid crashing into each other. Of course, this isn’t entirely accurate. What I mean is they get together at Mazda Laguna Seca Raceway, which is an important detail they insist you remember by placing the Mazda logo on everything they can find, including the urinals. But while all of that sounds great, the best part is definitely the parking lots. I don’t know how many parking lots I visited when I was there last year, but I’ll conservatively place the number at “however many parking lots exist in the greater Monterey Bay Area.” And I left every single one of them with a huge smile on my face. A huge smile, and, in some cases, a summons for trespassing. The reason for all this parking lot fun is that, during Monterey Car Week, every single parking lot in the general vicinity of Monterey contains at least one exotic car, or unusual car, or vintage car, or car you had completely forgotten about since childhood and here it is in perfect condition. And pretty soon, you’re addicted. Seriously: it only takes about one Lamborghini Jalpa parked next to a Packard for you to start thinking: I wonder what’s in the next one. And before you know it, it’s 1 a.m. and you’re photographing a Ferrari 599 GTB Fernando Alonso Edition parked at the Monterey Super 8 Motel, which has increased its prices from the usual $49.99 for a night to $279.99 for three hours of sleeping on a cot in the main lobby. And for this reason, I say: go to Pebble Beach. And visit the parking lots. No, the cars won’t be as pristine as they are at the Concours. And they won’t be operating in the kind of “please-don’t-hit-me” anger that accompanies the Monterey Historics. But there’s something so cool about seeing a Lamborghini Miura with valid license plates sitting in a normal parking garage and just knowing it arrived on the road, with other vehicles, under its own power. Just like the 5-Series with the painted interior.